Actor Steve Buscemi stepped behind the camera for 2000’s Animal Factory, his second feature film as director. Based on Edward Bunker’s 1977 novel, we meet Ron Decker (Edward Furlong), a young man who winds up in prison due to marijuana possession. From a privileged family, this situation blindsides Ron and he struggles to cope with his new incarcerated life. Older inmate Earl Copen (Willem Dafoe) takes Ron under his wing and helps him deal with his situation. If nothing else, Factory benefits from Buscemi’s connections, as the film enjoys a strong cast. In addition to Dafoe and Furlong, we find Danny Trejo, Mickey Rourke, Seymour Cassel, John Heard and other recognizable faces – as well as Buscemi himself in a small role. Unfortunately, Factory doesn’t have much going for it beyond its actors, as it delivers a surprisingly tepid prison movie. Let’s face it: we’ve seen this kind of story many times in the past, so another entry in the genre needs something unusual to stand out from the crowd. Factory can’t muster the spark or originality it needs to find its own identity. Instead, it seems like a conglomeration of clichés in search of a narrative. Granted, Factory doesn’t need a specific plot, as it can tell a simple tale of the experiences suffered by the new inmate. That should be enough to keep the viewer engaged for its 94 minute running time. It’s not, though, as Factory tends to drag. The movie seems oddly toothless and lacks the grit one would expect from a tale of this sort. Oh, Factory throws out intermittent examples of brutality and degradation, but it doesn’t invest in these well. No, it doesn’t make prison look fun, but it also fails to give the experience a particularly dark or vicious feel. The actors do fine in their roles, so I can’t blame them for the film’s blandness. 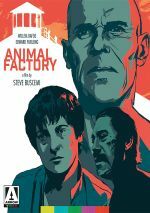 Buscemi just doesn’t seem willing to create a movie as ugly as it needs to be, so that leaves Animal Factory as an oddly benign experience. Animal Factory appears in an aspect ratio of approximately 1.85:1 on this Blu-ray Disc. This seemed like a surprisingly bland image for a movie from 2000. Sharpness appeared good for the most part. I didn’t think the movie offered great delineation, but it provided adequate clarity and definition. No signs of shimmering or jaggies popped up, and the image also lacked edge haloes. Occasional specks and spots appeared – nothing heavy, but these were a nuisance at times. Colors tended to be flat, though probably by design. Still, even with the gritty nature of the project, the hues seemed somewhat dull. Blacks were acceptably dark, while shadows presented decent smoothness. Though this always remained a watchable image, it never became much better than that. I also found little to impress with the movie’s DTS-HD MA 2.0 soundtrack. The soundscape seemed awfully restricted for a movie from 2000, as it failed to use the various speakers in a lively manner. This meant we got modest stereo separation for the music and not much more. Effects occasionally broadened to the side speakers in a gentle manner, but the majority of the track felt monaural in nature. Audio quality appeared acceptable. Music showed reasonable vivacity, while dialogue was natural and concise. Effects lacked much heft, but they also came across with decent clarity and accuracy. I expect more from a circa 2000 movie than this mediocre mix. A few extras pop up here, and we find an audio commentary from novelist/co-writer/actor Eddie Bunker and actor/co-producer Danny Trejo. 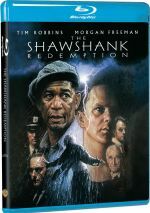 Both sit together for this running, screen-specific look at the film’s roots and development, story and characters, cast and performances, locations and real elements behind the movie’s fiction. Recorded for a 2001 DVD, this proves to be a fairly dull commentary. Trejo heavily dominates and he occasionally interjects some interesting notes about life in prison, but those moments remain rare. Instead, we tend to get lots of dead air along with the occasional banal comment about the quality of the production. Though not without worth, the track lacks much value. In addition to the film’s trailer, we get a featurette called Eddie Bunker: Life of Crime. It runs 20 minutes, 50 seconds and presents an interview with critic Barry Forshaw. “Crime” looks at Bunker’s life and career. Forshaw manages a good overview of the subject matter. The package concludes with a booklet. It includes photos and an essay from critic Glenn Kenny. It’s a good complement – though I’m not sure how the credit for “RobertEbert.com” got past quality control. A lackluster stab at the prison genre, Animal Factory fails to deliver much juice. The movie comes across as flat and banal too much of the time, without meaningful characters or situations to impact the viewer. The Blu-ray offers mediocre picture and audio along with minor supplements. Despite good talent attached, Factory disappoints.